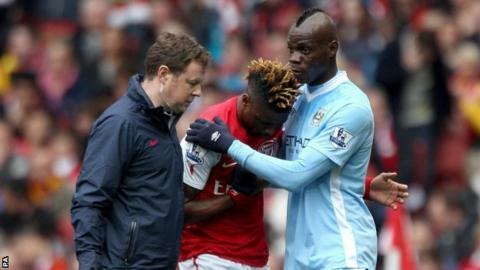 Manchester City manager Roberto Mancini may recall Mario Balotelli for Monday night's derby versus Manchester United. The 21-year-old Italian striker has not played since being sent off against Arsenal earlier this month. At the time Mancini said the controversial striker would not play for City again this season. But he said: "It's difficult to say today if I will recall Balotelli but everyone is available and I will make my choice on Sunday." Speaking to France Football, he added: "Despite some stupid things he has done, Mario has done some important things, like his double strike at Old Trafford this season. "With him anything anything is possible." Balotelli's dismissal in the 1-0 defeat at the Emirates marked a low point for City. At the time they dropped eight points behind United. The margin at the top of the Premier League table has since been cut to three but Mancini insists he feels no animosity toward Balotelli. He said: "It's like a family when a child does stupid things. "The affection of the parents is still there. He's young and he commits big mistakes that can put the team in difficulty, but I still think he has great talent and I hope he will be a City player next season. It's all in his hands." Meanwhile, City defender Joleon Lescott believes Balotelli has learned from his mistakes. He said: "[Mario] needs to look at his performances and, if he sees he has disappointed the lads, it's great that he's realised that. "He's a young lad, we all make mistakes and it's going to happen. When I was his age I was making mistakes in the Championship and it was going unnoticed." Will it be a Blue - or Red - Monday? Read more on Will it be a Blue - or Red - Monday?